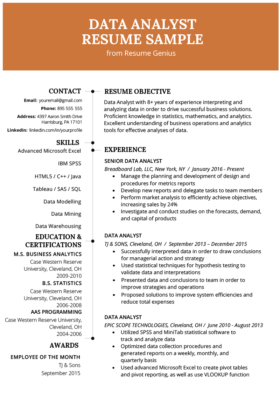 Check out the Data Analyst Cover Letter sample and writing tips below to give yourself the statistically best odds of landing your next job. I have spent the past 5 years doing number crunching and database management for a SAAS business, and I am keen to continue developing my career in the field of data analysis. I have always been a numbers person, with exceptional mathematics and computer skills. I am fluent in a number of data management systems and software, including Excel, mySQL, SPSS, and Oracle 11i. Statistical significance, A/B testing, and data-driven optimization are the rhythm of the drumbeat I march to. As much as I’m into data manipulation, it’s the analysis of data that really gets me going. I like to explore the relationships between numbers, and translate digits and spreadsheets into stories. In the age of big data, these stories become actionable solutions and strategies for businesses, and I take pride in my ability to make data accessible to both executive decision-makers and frontline sales staff. On a personal level, I am detail-oriented, organized, and precise in my work; the only thing cleaner than my room are my spreadsheets. I have strong communication skills with a knack for clear and illuminating presentation. I’m comfortable on my own facing the numbers, but I really enjoy being part of a motivated team of smart people. Please find my contact information at the top of this letter, as well as on my enclosed resume. I appreciate your time spent reading this letter, and look forward to connecting in the future. Data analysts are professionally obligated to bring a high level of attention to detail to their jobs, and you’ll want to reflect this in your cover letter – absolutely no spelling or syntax errors allowed. Start your cover letter with a short intro paragraph introducing yourself and detailing the position you are applying for. In your second paragraph, put the spotlight on your years of experience in the field, but leave the details for your resume. An intro line about your years of experience segues nicely into a description of your professional skillset and core competencies. It’s also important to present your human side – you’re not just a number! Be sure to include a bit about your personality and why you’re a great fit for the team you’re applying to. There are quite a few data management and systems and software in the field of data analysis, so be sure to highlight those with which you are experienced, and in particular the ones mentioned in the job posting. If you don’t have experience with the specific software the company you are applying for uses, you’ll want to emphasize your ability to learn and become proficient in new systems quickly. Once you’ve outlined the skills that specifically match the needs of the company you’re applying to, make a point of describing the broader skills you have that make you an attractive candidate. Communication and presentation skills are commonly highlighted as important skills for data analysts to have, as you can be sure that not everyone in your company will be as fluent in the language of numbers as you are. Your ability to take data and make it accessible to the less numbers-oriented among us could be the difference-maker in getting your next job or not. Lastly – be prepared for a test analysis project to be thrown your way as part of the application process. Think of this as not just an opportunity to present your numbers savvy, but also your presentation skills. Take whatever they throw at you and send it back as a report you’d submit to the CEO, not the numbers guy/girl. Always happy to help. Good luck on your job hunt! How should the new graduated people write a cover letter? and how can they write a cover letter for applying in internship vacancies? It’s perfect for applying for internships.